This year's movies share a couple of major preoccupations: the apocalypse, and fables. One obsession has to do with our sheer terror about the future, while the other has to do with our longing for an idealized past. So it's jolting and thrilling to watch a movie like Beasts of the Southern Wild, which takes both of those motifs in radically different ways that will keep coming back to you long after you walk out of the theater. Beasts of the Southern Wild will not be for everybody — it's loosely adapted from a stage play, and still has some of the "stage play" feeling clinging to it. It's also very cinematatic, however — the action is beautifully filmed, and the island community where it takes place is a vivid part of every scene. In any case, everybody who's interested in seeing fantasy and apocalyptic elements taken to a new place absolutely must check out Beasts. This is one of those movies that everybody is going to be talking about. In Beasts, Hushpuppy is a six-year-old girl living with her father in the Bathtub, a small island community in the Gulf. The people in the Bathtub have no money and live in incredibly rough conditions, but they have a ready supply of fish that they can just scoop out of the water. Unfortunately, the Bathtub is on the wrong side of the levees, so they're in constant danger of being flooded. And indeed, when one especially violent storm comes along, their community faces destruction. Meanwhile, Hushpuppy realizes her father is dying — and she starts seeing Aurochs, ancient beasts from the Ice Age, closing in on her community. The central relationship in the film, between Hushpuppy and her father Wink, is kind of disturbing — late in the movie, we're told that Hushpuppy hasn't been held since she was born. Wink's main approach to parenting is to yell at his six-year-old kid, and he leaves her to fend for herself for long periods. It's not really much of a surprise when, early on in the film, Hushpuppy burns down the trailer where she's living (alone.) She's forced to move in with her father, who draws a line down the middle of the shack so she won't come into his part of the house. And yet, we come to understand that Wink loves his daughter, and is trying to prepare her to survive without him because he's dying. He's trying to teach her strength — and this dovetails with a major thread that runs through the film, of Hushpuppy as mythic figure. She will be a leader of this struggling community, or maybe the archivist who keeps a record that future generations will know about. 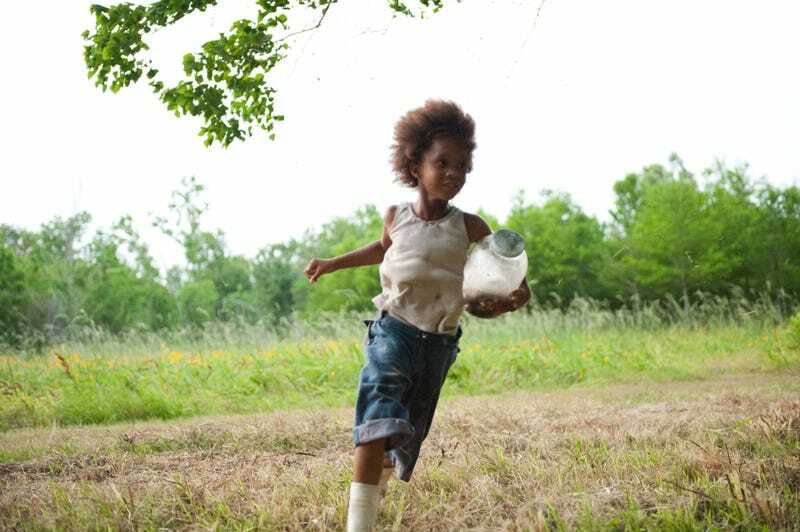 And honestly, it's impossible to understate the importance of star Quvenzhané Wallis, who plays Hushpuppy and brings an amazing intensity and personality to the role. She's our window to this world, and her love for the Bathtub and for her father are what carry us forward. Her dreams of finding her long-missing mother, and her musings about the nature of history keep propelling us forward. And she's just kind of a force of nature, in a movie that's about forces of nature. The other thing that really stands out about this movie is the insane use of texture — the dirt gets under your fingernails as you watch this movie. You absolutely can feel the cold water, the squirming piles of seafood, the dirt and crazy clutter in people's homes, and the corrugated tin of their roofs. And meanwhile, during our brief visit to the "mainstream" world, you feel the sterility and dehumanizing blankness of that world. As much as this movie explains the Bathtub and its place in the world to us, it also uses texture in such a vivid way that we already know everything we need to. If Beasts is the story of Hushpuppy becoming a hero to her community, then its mythic elements are bolstered by a whole bunch of strange elements that are best described as "magical realism," for lack of a better term. In particular, there are the Aurochs, those giant horned beasts that Hushpuppy sees coming for her — they're like a representation of all the forces that are seeking to destroy Hushpuppy's world, but they also represent history and survival. The Aurochs, especially, seem to represent the destructive power of nature, and Hushpuppy needs to learn to face up to them and tame them, so she can be the person the Bathtub needs to survive. The Bathtub is caught in a crush between raw nature and the oppressive demands of "mainstream" civilization. All in all, Beasts is a small, personal epic, about loss and survival. It feels like it's groping towards mythic territory, and at times it brushes against feeling like a huge apocalyptic tale about a flood that sweeps everything away. But most of all, it's an intensely real story about one girl's adventure in a totally unique community on the edge of extinction. It's got sharp edges and an unforgettable vividness. Check out our exclusive interviews with director Benh Zeitlin and stars Quvenzhané Wallis and Dwight Henry here.